You can link back using these buttons. 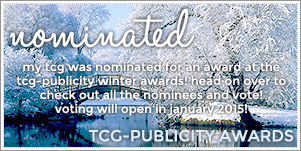 If you were nominated, you can use this badge to display on your TCG (or wherever you'd like). It'd also be nice if you linked it to this site so people can vote for you!